Next time you’re in Park City, Utah, be sure to hit a local favorite watering hole — the High West Distillery & Saloon. Whether you’re visiting in the summer or during the peak ski season, it’s an experience you don’t want to miss! 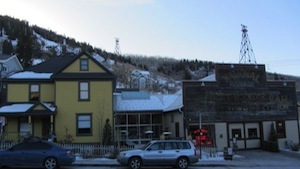 Just a block off historic Main Street, at the bottom of the Quittin’ Time ski run, sits the “world’s first and only ski-in gastro-distillery.” You can’t miss the 250-gallon copper still gleaming in the front window. The restaurant and saloon are housed in a two-story Victorian house built in 1914 and the adjoining “National Garage,” once a livery stable for workhorses in the local mines. When automobiles became the latest rage, the stable was converted to a service station. After a short wait, we were led through the walkway, past the still, and up a narrow flight of stairs into the adjacent house. Upstairs, we were seated in a cozy room overlooking historic Park City. Western vignettes of Roy Rogers and Annie Oakley adorned the walls while Johnny Cash music played in the background. The drink menu boasts a number of tasty selections. From popular High West favorites (be sure to try the High West Lemonade) like Dead Man’s Boots and Whiskey Smash to the classic Manhattan or a shot or two of in-house distilled spirits, you’re sure to find something to whet your whistle. The seasonal food menu is equally impressive — and affordable. You can enjoy unique and lip-smacking “saloon bites” that promise only the freshest ingredients (and a dram or two of whiskey) in every dish and include bacon- and bourbon-flavored High West Popped Corn. Ask your waiter about the featured specials. We tried a juicy heirloom tomato stack (grown in Utah) and a zesty Wild Rice Mushroom Soup (yes, there was a delightful kick to it). For the main dish, there’s something for everyone, whether you’re a meat lover or a vegetarian. Small plate offerings include Black Coffee & Bourbon Glazed Cod, while large and specialty plates feature Pan-Seared Utah Trout topped with Roasted Grape & Caper Berry Sauce, Idaho Elk with Chanterelle Mushrooms, and the infamous High West Burger. If you’re in the mood to share a meal, try the Whiskey Cheese Fondue. You can even get kid-friendly Lil’ Buckaroo plates for the youngsters — mac ’n’ cheese, spaghetti, and other kid faves. Summer desserts range from fresh fruit cobblers to a whiskey and chocolate sampler and more. On your way out, don’t forget to stock up on your favorite spirits — the General Store is the only state-registered store open for bottle sales on Sunday in Utah. In a state with strange alcohol laws (it’s dry on Sundays, folks! ), it’s nice to know you can get a dram or two of whiskey when you want.